The gyroscope has many practical uses (think land, air, and space) but this one will surprise even the most experienced physicists. 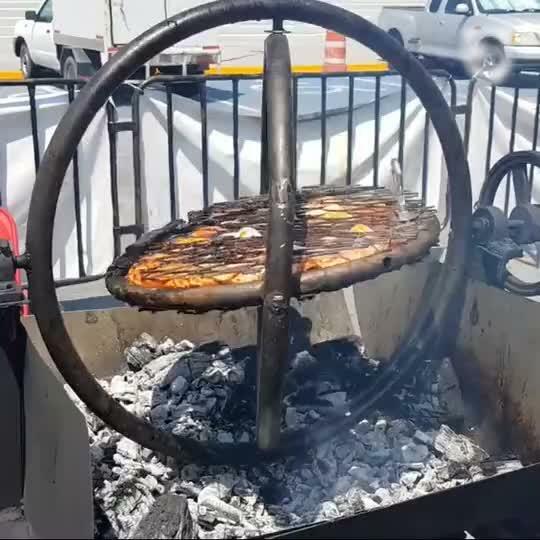 Gualberto Elizondo has shared a video of a gyroscope grill and it has the internet drooling. Gyroscopes are perfect for maintaining orientation, so in theory they should be perfect for the low-and-slow cooking method which allows the center of the meat to come up to the desired temperature with less risk of overcooking the outer layers as well as minimizing the loss of flavorful juices. If you like your steak Apollo-Mission-ready, then this BBQ set is definitely for you. This would work great in an enclosed grill. This 'open' method is just too inefficient ,because so much heat escapes. All fun and games untill it opens up a portal to the hellish Event Horizon dimension. Makes me feel a bit sick watching it lol would put me off my food! Reminds of those things they have at theme parks and the like that make you feel awful and dizzy.